“…in the poorest parts of the country, we are withdrawing the preachers. The harvest is rich, but the labourers have been re-deployed to wealthier areas. We are seeing the slow and steady withdrawal of church life from those communities where the poorest people in our nation live. “And that matters. For the past 25 years I have been delighted to see a vast and ever growing industry of evangelism that now sets the pace in the Church of England. The Archbishop of Canterbury is passionate about evangelism and has made it one of his major priorities, backed up with initiatives such as ‘Thy Kingdom Come.’ Dioceses almost all have strong growth strategies in place. The Church Commissioners have released £100m in assets to invest in mission initiatives. Planting new congregations has become an industry in itself, even having its own Bishop and backed up by the work of New Wine, HTB, Fresh Expressions, Messy Church and many others. We have had over two decades of evangelical ascendancy and the majority of senior leaders will now emphasise mission and evangelism above anything else. New evangelistic resources appear on the scene all the time, countless new para-church groups and agencies appear with fresh ideas or new materials. We massively emphasise discipleship to try equip existing Christians to share faith more successfully. I could go on and on. This is a vast and ever-growing industry. “And what has been the impact? Accelerated decline. In 2001, according to census data, 71% of the UK population identified themselves as Christian. In just ten years, that figure had dropped to 59%. And the trend continues. The 2016 British Social Attitudes Survey found that 48.5% of the population said they were ‘nones’ (ie that they have no religion), outnumbering Christians who were just 43.8%. Between 1980 and 2015, the percentage of the population attending church declined from 11.8% of the population to 5.0%. In the Church of England attendance decline increases steadily each year and averages around 2% to 3% per annum. “We are all trying massively hard to renew the Church. We are working like crazy, we are praying like mad, we are trying every new idea under the sun. Yet the longed-for renewal does not seem to come. In fact decline just seems to speed up. Why? Why are we struggling so much? I want to suggest that the answer is quite a straightforward one. It’s because we have forgotten the poor. “…The lesson of scripture, the lesson of the past is clear. If we want renewal, we must start with the poor. And yet in the Church of England we have a mission approach that is almost entirely focussed on the needs and aspirations of the wealthy. Rather than speaking good news to the poor, we are complicit in the abandonment of the poor. “…Nationally we spend £8 per head of population on ministry. In some rural areas that figure rises to £24 per head. On the estates we spend just £5 per head, by far the lowest. The poorer you are, the less the church values you. “…When my old Parish in Hartlepool, a thriving estates Church, was vacant a few years ago, it was over two years before the Bishop could appoint. Clergy didn’t want to live in that kind of area, they didn’t want their children educated alongside the poor – you’ll know the litany of excuses. At the same time a Parish in Paddington was advertised and at once attracted 122 expressions of interest. That is the true measure of the spiritual health of the Church of England. “…in 2011 the Synod of the Church of England passed a new table of fees that massively increased the cost of funerals and weddings. Normally if you want to work Synod up to a frenzy you give a rousing speech about a bias to the poor. They love to listen to that sort of thing, but they don’t like to pay for it. That fee increase was nodded through with just two votes against. Without any real fuss at all, we calmly priced the poor out of the ministry of the Church. “…If you go to a suburban church you will usually find a comfortable and well maintained building with carpets, heating, clean toilets and good music. Estates churches rarely have the money to maintain themselves properly. If you’re poor all you’re worth is a cold and half derelict building. “…The Church loves to rail against social inequality. And yet we absolutely model the social inequality we so often condemn. The Church of England loves to boast about being a Christian presence in every community. And yet in those communities that most need to hear the message of hope we find in Jesus, that presence is ever weaker or non-existent. “…Areas characterised by social deprivation desperately need a Gospel of hope. And yet what are we doing? We are withdrawing. We are under-investing. What kind of church is it that turns its back on the dispossessed, or offers them only crumbs from the table of the rich? “…I remember once when I was running an estates Church in London I was rung up by a member of the Diocesan finance team who said, in passing, ‘Well of course you are a subsidised Parish aren’t you?’ And I realised that for the previous 20 years of my ministry, that’s how I had thought of myself. A subsidised priest, only able to minister because of the largesse and generosity of the wider Church. But who is subsidising whom? Yes, arguably, there may be a small financial subsidy from rich to poor. But the spiritual subsidy flows the other way. It is the rich church that is subsidised by the poor church, because unless it is proclaiming good news to the poor, the Church is not the church at all. “…we need to reflect on the content of our proclamation. There is a perception that there is a single, verbal Gospel message that can be picked up and dropped from place to place. ‘Christ died for our sins.’ ‘Life in all its fullness.’ Those well-known statements which so easily trip off the Christian tongue. But the Gospel is not a message. It is a person, Jesus Christ, and the way he speaks into different contexts and situations differs from place to place. If you turn up on an estate with nice, tidy complacent answers to questions no one is asking, they will tear you to shreds. Successful evangelism begins with intense listening, with a profound desire to hear the issues on people’s minds and a genuine open heart to discern how Jesus speaks into them. If you’re in debt, what is the good news? If you’re dependent on a foodbank to feed your children, what is the good news? If you’re cripplingly lonely and can’t afford the bus into town, what is the good news? Simple formulae, or trite clichés about God’s love won’t do as answers to these questions. “…We need to raise up leaders in, for and from the urban church. The best person to speak the Gospel into an urban estate is someone who has grown up there, so we need to be courageous and take risks in raising up a local leadership. Catapulting in 200 white, well-educated, beautiful people from the nice bit of town will dispossess and disempower local residents. The impact will be to take their church away from them such that the church will become just another service provided on their behalf by patronising outsiders. In the Church of England our current structures for selecting and training licensed lay or ordained leaders are woefully unfit for purpose and deliver only white, graduate class leaders. The time for tolerating this systemic failure is now over. We must take risks in raising up local leadership, leadership that cannot and will not speak the jargon-laden drivel of the contemporary church but will instead have the Gospel energy to transform it. “…I am astonished at the number of people Jesus is calling to plant new churches as long as they are in Zones 1 and 2 of the London transport system. It’s the wrong place to start. Renewal comes from courageous mission to the places where it’s toughest. If you feel called to plant, we need you on the outer estates, we need you in our northern towns, we need you in areas where a majority of people come from other world faiths, we need you in those areas where the trendy coffee shops and artisanal bakers are hard to find. Come there if you really want to make a difference in Jesus’ name. “…We know the stats. Within 10 years we will have all but lost the Church in the poorest areas. We will have become a complacent, smug church of and for the rich. The spirit of the Lord is upon Bishop Philip North, because God he has anointed him to preach good news to the poor. He has sent him to proclaim release to the captives and recovering of sight to the blind, to set at liberty those who are oppressed, to proclaim the acceptable year of the Lord. And God has also anointed him to preach a few prophetic home truths to the lukewarm wing of the Church of England. 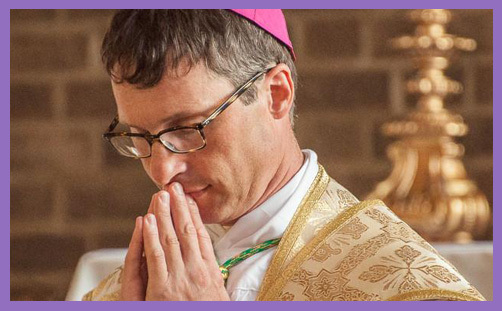 What a pity that so many believe him to be ‘unsuitable‘ for episcopal advancement – indeed, that to appoint him a diocesan bishop would “cause significant pastoral and public damage to the church” – just because of his orthodox catholic beliefs about sacerdotal ministry.